LAS VEGAS — If anyone can convince a skeptical public that Gonzaga is deserving of a No. 1 seed when the NCAA tournament bracket is revealed Sunday, perhaps it's the head coach of the Zags' biggest rival. Asked after Monday night's WCC title game if he thought Gonzaga had accomplished enough, Saint Mary's coach Randy Bennett chuckled and insisted he'd be "shocked" if the Zags weren't on the bracket's top line. "How could they not be?" Bennett said. "They've got two or three losses less than everybody. I vote every week, and I know where my vote goes. Other teams have lost games you think they probably shouldn't lose. They haven't." There's nobody more qualified to evaluate Gonzaga than Bennett, whose program had been steadily closing on its rival in the WCC pecking order for the past few years until this season when the Zags responded by widening the gap. Gonzaga handed Saint Mary's its only three losses since Christmas, the final one a convincing 65-51 rout in Monday night's WCC title game. Despite returning the core of a team that swept the WCC regular season and tournament titles last March, Saint Mary's looked thoroughly overmatched. Gonzaga methodically but decisively enacted revenge, building a 19-point lead by the early stages of the second half by overpowering the Gaels in the paint on offense and stifling Saint Mary's star Matthew Dellavedova on defense. 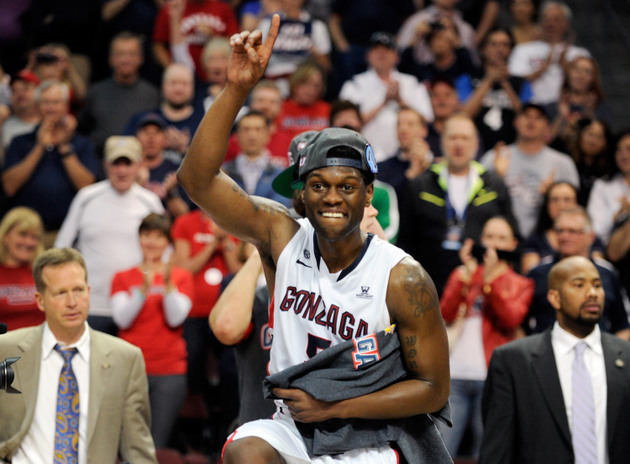 "That's the best [WCC] team since I've been coaching," Bennett said. "We have a good team. A very good team. One of our best teams. And we couldn't beat them this year." The question of whether Gonzaga is worthy of a No. 1 seed has emerged as one of college basketball's hottest debates as the Zags have piled up win after win in the WCC. They'll enter the NCAA tournament with by far the best record in the nation, a 31-2 mark marred only by a buzzer-beating loss at Butler and a home loss against Illinois. Supporters of the Zags note they beat Big 12 powers Oklahoma State, Kansas State and Oklahoma in the preseason and dominated WCC opponents by an average of more than 18 points per game. Detractors of the Zags are quick to point to their modest strength of schedule and question if they could amass a similarly sparkling record playing in a powerhouse league like the Big Ten or Big East. Gonzaga coach Mark Few is mostly amused by the debate because he doesn't think there's a huge difference between a No. 1 and No. 2 seed in the NCAA tournament. Nonetheless, he bristled at the lack of respect he feels his team has sometimes received despite being a botched out-of-bounds play at Butler from having only one loss. "We did a great job controlling what we could control," Few said. "I don't know how many other teams could roll in here to the WCC and go undefeated. Provo is not an easy place to play. Moraga is not an easy place to play. Sometimes that gets lost in all this. Another thing that gets lost is maybe if we were in some of those teams' leagues, maybe we'd only have three losses. I don't know. This is team is showing itself pretty well." The obvious reason this Gonzaga team may be Few's best is its frontcourt, which is one of the nation's best. 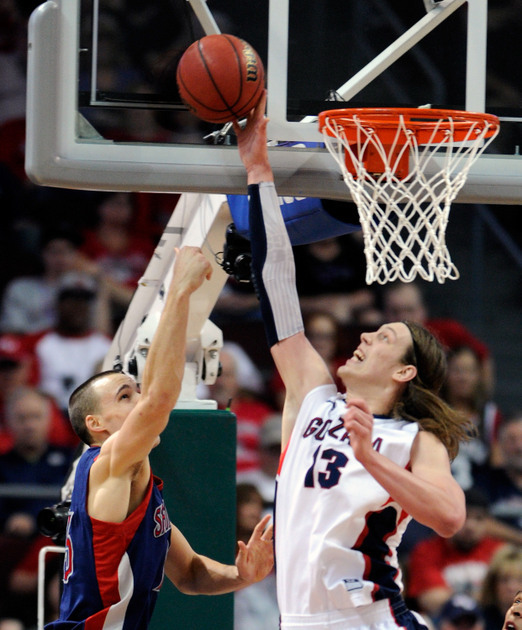 High-scoring Kelly Olynyk is an All-American candidate and senior Elias Harris scores and rebounds at a high level, giving the Zags the luxury of bringing talented Sam Dower and promising 7-foot freshman Przemek Karnowski off the bench. What gets lost because of Gonzaga's ultra-efficient offense is its development on defense, traditionally not an area of strength for the Zags. It remains to be seen whether Gonzaga will be as effective against teams from out of conference, but the combination of Olynyk's ability to protect the rim and the smothering perimeter defense of Mike Hart and Gary Bell has made it difficult for opponents to generate clean looks on offense. "It's been brewing now for a while," Few said. "For the past six weeks, our [defensive efficiency rating] has been pretty good and they've been dialed into it and interested in what it is after games. Tonight was a culmination of that because we took a great player and really took him out of the game." Indeed Gonzaga looked the part of an improved defensive team Monday night, especially the way it shut down Dellavedova. Unwilling to let Dellavedova slice them up off the dribble, the Zags trapped every ball screen Saint Mary's set for its standout point guard and forced the ball out of his hands. Stephen Holt sometimes made Gonzaga pay for its double teams with 19 points on an array of jump shots, but too many of the other Gaels weren't aggressive enough to offset Dellavedova's two-point, 1-for-8 shooting performance. Even if Saint Mary's had been scoring at its usual efficient clip, the Gaels still might not have been able to keep pace. No matter how many defenders Saint Mary's ran at Kelly Olynyk and Elias Harris, the Gaels were unable to prevent either Gonzaga big man from scoring with ease in the paint. The duo combined for 40 points on 15-for-25 shooting, a dominant effort that kept the Zags' shooting percentage above 60 percent until the game's final minutes. "We weren't the defending champs, so that gave us motivation to win this game," Olynyk said. "We really wanted to win this game. It was one of our goals since the beginning of the season, and it felt great to accomplish that." After its starting five exited with a 19-point lead and less than two minutes remaining on Monday night, the pro-Gonzaga crowd at Orleans Arena serenaded them with chants of, "No. 1"
Few agrees. So does Bennett. We'll find out Sunday if the selection committee does also.